Last week, the Islamic State claimed responsibility for the December 18 attack in Karak, Jordan, which killed ten people and injured 34 others. Following the attacks, pro-ISIS social media users, especially on the Telegram, posted pictures and messages celebrating the attack and the harm and hurt that it came from it. Many of these posts also included a number of threats, including: ISIS continuing to attack Jordan, the assassination of King ‘Abdallah, and target security forces and clerics who cooperate with the government. One post even threatened “Crusader” (Western) tourists who visit Jordan, saying they will not be safe in Muslim countries. Another post read: “Today we take vengeance on you, oh you apostates. Today we avenge the women and the children you killed by bombing the cities of the caliphate. Today we bring joy to all those who lost their loved ones, the widows and orphans, and quench their thirst for revenge,” as a response to Jordanian airstrikes on cities controlled by ISIS. The day of the terror attack in Karak, Jordan was the same day as the first Christmas for Refugees program in Amman, Jordan’s capital. There have been an increased number of terrorist attacks in Jordan as many Islamic extremists are returning to Jordan from Syria. 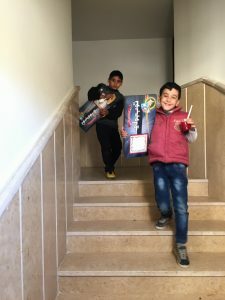 Despite the attack in Karak, the Christmas for Refugees program continued on and served hundreds of displaced Christian children by hosting a Christmas program for them that featured puppet shows, games, activities, coloring books, a traditional Christmas meal and hygiene or food bags to take home to their parents – all while learning the joy of the Gospel. The Christmas for Refugees program also serves displaced Christian children in Iraq and Lebanon. To find out more about the Christmas for Refugees program, click here.